Take control. 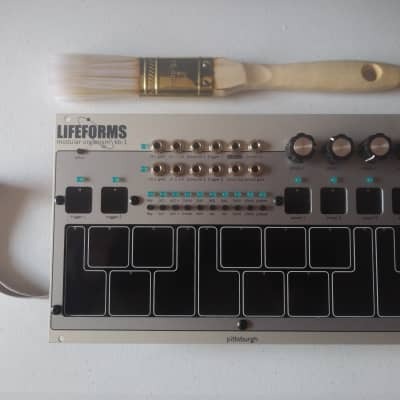 Shape your music like never before with the new Lifeforms KB-1; a unique and intuitive set of tools designed for controlling your eurorack modular system. 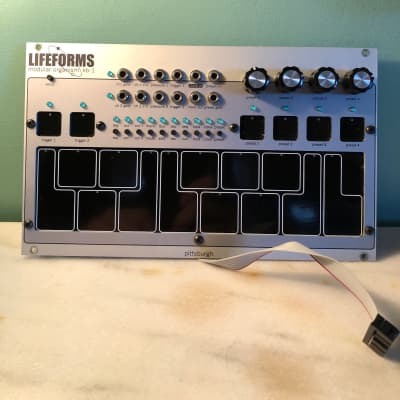 The Lifeforms KB-1 provides a multi-function, expressive, capacitive touch keyboard designed for performance. The KB-1 contains a powerful one octave adjustable, pressure sensitive keyboard complete with arpeggiator, step sequencer, four voltage memory pads and two trigger pads. Eleven outputs and a deep feature set enable you to explore new sonic territory with an unprecedented level of control. Monophonic and Duophonic response modes with user-selectable note priority and retrigger options let you customize the KB-1 specifically to your needs. Octave buttons provide quick selection of one of seven available octaves for a wide sonic range. Monophonic mode allows you to perform soaring leads, buttery basslines with legato, or classic arpeggios. Or, take control of two separate oscillators in Duophonic mode to create rich soundscapes, complex drones and arps, lush pads, and thundering bass. Easily program melodic sequences with maximum flexibility. 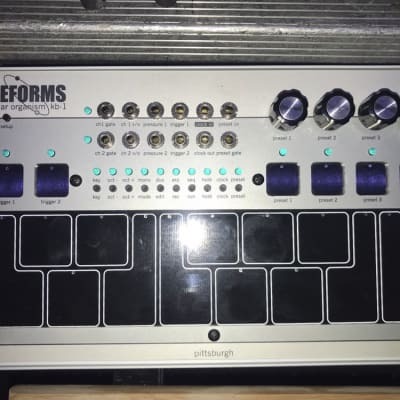 Along with immersive keyboard features, there is also a powerful ten note arpeggiator and sixty-four note sequencer, each focused around playability, empowering you to craft inspiring melodies, or utilize the stepped voltage as control for other parameters, such as filter frequency or VCA control. The Lifeforms KB-1 features a playable, ten note arpeggiator. This robust arpeggiator can cycle through one to three octaves. 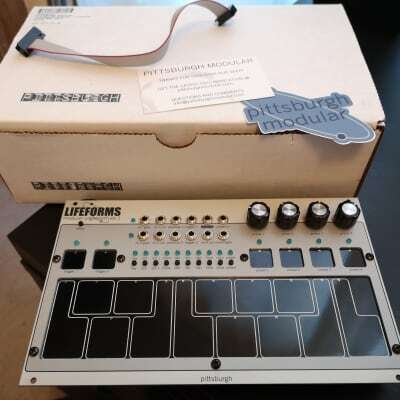 The arpeggiator in the Lifeforms KB-1 contains three different arpeggiator modes, including single or double note trigger, and random monophonic or duophonic note cycling with random gates . Probability gate burst mode can trigger additional random gates to add complexity to arpeggios. This feature, unique to the Lifeforms KB-1, enables you to have rolling pulses divided by the clock source, allowing for dramatic rhythmic variations of your sequence. A feature-packed sixty-four step sequencer with multiple play modes gives you precise control over the cycling of your sequence. Sequences can be played forward, reverse, or random. Sequences are quickly created by step programming and each step can have one of six step modifiers: pitch bend, tie, single trigger, double trigger, quad trigger, and whole note. Once the sequence is complete, the first note of a sequence can be shifted back or forward, resulting in generating new sequences out of your initial performance. Probability gate burst mode is also available to sequences adding realtime complexity to a performance. Express yourself. The two assignable trigger buttons enable you to unleash your creative potential in new ways. Trigger 1 and trigger 2 can be independently assigned to one of six different trigger button modes including pressure sensitive pitch bend, gate, latch enable/disable, trigger, pressure sensitive trigger burst generator, and a pressure sensitive clock divider. Preset voltage memories. The programmable voltage memory section can function as a four channel sequencer, cycling forward, reverse, or randomly; or the active channel can be selected manually allowing the section to function as a 4 channel voltage memory. Voltages are unquantized analog voltages between 0 and 5 volts. Multiple clocking options are available to drive the preset voltage memory sequencer. On the beat. 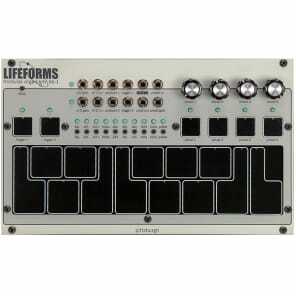 The Lifeforms KB-1 can be clocked internally via tap tempo or from an external clock source such as a sequencer, square wave, trigger, or clock divider. This allows you to either play on your own, or perform locked in time with external devices.